There are times when it is very easy to imagine that the Biblical prophesies are specifically describing the world we are living in right now. Tonight we heard Jesus speak of the temple being torn down and then saying “Nation will rise against nation, and kingdom against kingdom; there will be earthquakes in various places; there will be famines. This is but the beginning of the birth pangs, for the end is still to come.” He seems to describe a global situation of escalating conflict and chaos, and when we turn on the World news, there it is before our eyes. Chaos, mayhem and mass death on the streets of Paris and Beirut. Ancient temples being blown up and torn down. The apparent chaotic lawlessness and brutality of the badly misnamed Islamic State seems worse than anything anyone can remember. But it is not only them. In the conflict in Syria, where ISIS are just one of the parties, we’ve seen the USA bomb a hospital and now we have Russia stepping in and bombing areas that don’t even seem to be held by ISIS. The situation seems to be spiralling out of control, and nobody seems to have any realistic plan to resolve it. It is hard not to think that Jesus was forecasting 2015. The connection won’t be immediately apparent, but I want to mention a seemingly unrelated and much lower profile piece of news. 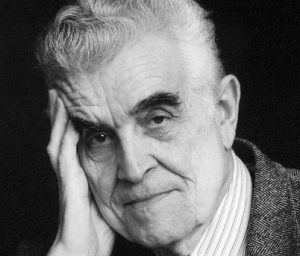 Eleven days ago, one of the great thinkers of the 20th century, René Girard, died peacefully in his sleep at the age of 91. I haven’t mentioned his name very often in my sermons, but his thinking has influenced my preaching in the last five or six years probably more than anyone else. René Girard was a Frenchman who spent most of his academic career in the USA, and whose thinking spanned a number of disciplines. His doctorate was in history, and he taught as a professor of literature, but he is also remembered as a philosopher, social scientist, Christian theological thinker, and analyst of anthropology and culture. Perhaps Girard’s greatest contribution has been to articulate an understanding of the human condition, both individual and cultural, against which the Christian doctrine of salvation through Christ begins to make sense. If our world is spiralling into chaos and self-destruction, the kind of saviour people are hungering for is one who can save us from the bad things going on here and now, not just the bad things that might happen to you after you die. But without an adequate understanding of the workings of the present chaos, we had no way of understanding how the work of Jesus might save us from it. I am one of many people who would describe the effect of discovering Girard’s analysis of the world as being like putting on a pair of glasses that suddenly brought both human culture and the teachings of Jesus into clear focus. In the name of the Prince of Peace, he advocates absolute brutality, and without a hint of irony, he justifies this on the grounds that Islam is not a religion of peace. So who is he modelling his behaviour on? Jesus or ISIS? Whose image is he reflecting? Would you feel any safer in a society ruled over by this bloke and his friends than in a society ruled over by ISIS? Or are they mirror images of each others? As one expert in the study of extremism said in response to this, “Here we have an individual who is clearly radicalised, who is brandishing firearms while preaching holy war. The intricate conspiracy theories and crusader symbolism immediately brings to mind Anders Breivik,” the far-right terrorist who killed 77 people in Norway in 2011. I agree, but they also sound exactly like those of the enemies whose brutality he claims to oppose. And yesterday the French president Francois Hollande promised that his country’s response to the terrorist atrocities would be “merciless”. I completely understand that sentiment in the circumstances, but such words are pure gold for the extremist recruiters, and if they prove true, they show that the terrorists are winning, turning us into mirror images of themselves. So as Girard says, here we have the perfect recipe for the apocalyptic violence, brutality and chaos we are currently witnessing. Everyone utterly convinced of their own devout righteousness and responding to one another’s violence with ever increasingly brutal retribution in the name of their god. And if we return to the words of Jesus we heard tonight, you will notice that despite the mistake made by many readers, not once does Jesus suggest that the apocalyptic violence would be commanded or caused by God. Both Jesus and Girard are saying that this is simply what happens, what human culture repeatedly spirals into. Thus, says Jesus, don’t get carried away thinking that it is a sign of what God is about to do. We are not the first generation that thought that the violence and chaos couldn’t get much worse and so the end must be near. In fact, there is nothing in this prophesy from Jesus that predicts the end of the world. The only thing he says will be torn down is the temple. Probably to the Jews of his day, the destruction of the temple and the end of the world sounded like one and the same thing, but it is not what Jesus says. At one level, his prediction of the destruction of the temple is no more than what we have already been talking about: “If you keep retaliating against Roman oppression with more violence, Rome too will keep upping the ante. Rome will win and Jerusalem will be destroyed.” Forty years later, that is exactly what happened. And on another level, what Jesus is saying here is similar to what he was saying when he purged the temple, driving out the money changers and animal sellers and closing down the sacrificial system for the day: the old answers, the official sacred violence of our law and sacrifice are never going to set people free from this cycle. Jesus unmasks our “officially sanctioned” violence – religious sacrifice, war, capital punishment, etc – as just another crude imitation of the violence of those who we fear. The whole system is crashing down. Why? If we turn to the reading we heard from the letter to the Hebrews, we hear a reminder that the heart of the sacrificial system in the temple is the need to offer something to God in order to buy God’s forgiveness. And Jesus is saying that this is entirely unnecessary because it is based on an entirely wrong understanding of God – a view that misrepresents God as angry and judgemental and only reluctantly willing to let anybody off without punishment. This is very relevant to what we are saying about the likes of the United Patriots and ISIS. 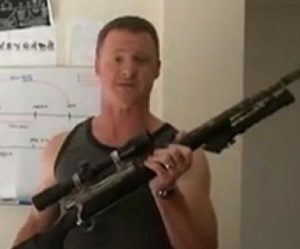 You may have noticed the press taking great delight in exposing how many of the high profile ISIS fighters have personal histories of crime and womanising and boozing that are seriously at odds with their expressions of devout religious commitment now. But this ridicule misses the point. People who are afraid that they will be eternally punished for their pasts will go to great extremes to prove their repentance and earn the forgiveness of a god whose mercy is, at best, only begrudgingly given. This is found just as often among Christians. Some years ago I met with a right wing Christian family-values zealot who had been repeatedly attacking me in public, and in the course of our conversation, I discovered that like me, he had been divorced and remarried, but that he remained very fearful about God’s judgement for that. I was able to see the world a little through his eyes in that moment, and understand the desperation that drove him to be the most zealous, most vehement opponent of the “sins” he still feared being judged for. Our reading from the letter to the Hebrews promised us that we can have confidence to enter the presence of God in full assurance of faith with our hearts sprinkled clean from an evil conscience and our bodies washed with pure water, because God gladly forgives all our sins and lawlessness, and so there is no longer any offering for sin. All this has been revealed to us when God came among us in the person of Jesus, calling us to follow him, to imitate him, and modelled for us the way of gratuitous mercy that overcomes hatred and violence with self-sacrificial love and grace. Jesus sacrificed himself by facing down the violent religious and political zealots of his day, and refusing to mirror their hostility, instead absorbing their bitterness in his own body and returning only love and forgiveness. When René Girard helped us to understand more clearly the workings of the cycle of hatred and violence, the nature of Jesus’s way of salvation became more apparent. Although, as Jesus says, he had the authority to call down armies of angels to violently repress the world’s enemies, he knows that that is to perpetuate the cycle, not to break it. Self-sacrificial love and forgiveness are the only answer that will work, and the only one that has almost never been tried in human history. It is only when we know ourselves utterly forgiven that we are healed of our fear of death and judgement and set free to offer ourselves for the life of the world. As forgiven people, we are not called to prove our zealousness in fierce crusades, imitating and outdoing our enemies. We are called to imitate Jesus instead, to love our enemies, and to turn our swords into ploughshares and our bullets into tubes of finger paint. Here at this table we taste the self-giving love that can conquer the cycles of apocalyptic violence, and we feed on the mercy that can sustain us for the journey through terrifying times. Here you are utterly forgiven. Here is the life that overcomes even death. Thanks be to God. If you have not previously discovered the work of René Girard, and would like to read more, I recommend starting with one or two of his interpreters rather than with his own books. The most delightfully accessible introduction I have read is called The Wicked Truth: When good people do bad things by Suzanne Ross (Glenview, Raven Foundation, 2007). It is especially good if you have seen the stage musical “Wicked” or read the novel, because it is half commentary on that story, but it doesn’t depend on having seen it. It is a good way in because Girard arrived at his theories from literary analysis too, so it is a good way of approaching the topic. My second, and perhaps more conventional, suggestion would be Compassion or Apocalypse: A comprehensible guide to the thought of René Girard by James Warren (Alresford: Christian Alternative, 2013). It is what it says it is. And for preachers, I would strongly recommend the Girardian Lectionary website. 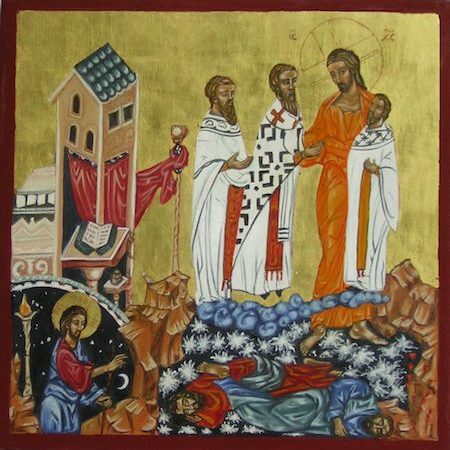 This is an extraordinary resource which, every week, brings together a good selection of extracts from the writings of Girard and his interpreters that shed light on the lectionary readings for the week. The site also contains a huge bibliography of Girardian books.